Rembrandt, Whistler -- and golf? It's true, and a new exhibition at Atlanta's High Museum reveals the link between fine art and the links. In "The Art of Golf," 90 works—serious, whimsical and sometimes rare—have been brought together to illustrate 400 years of golf history. "There's a lot of material that most golfers will not be aware of, and there's a lot of material that fine-art fans will not be aware of," says Rand Jerris, a senior official at the U.S. Golf Association and former director of the USGA museum, which lent some of its holdings. As early as the 17th century, Dutch landscape and genre artists were painting scenes of a cousin of the modern game, "kolf," which was played on Holland's frozen canals. Hendrick Avercamp's "Winter Landscape" (from around 1630) famously shows four "kolfers" aiming for a spot between two thin tree trunks. In 1654, Rembrandt made his famous etching "The Ringball Player" (sometimes known as "The Golf Player"). Both works are on view. The exhibit then moves to Scotland, where its co-organizer, the National Galleries of Scotland, has provided a series of iconic 18th-century Scottish golf portraits, among them a full-length view of the youthful, tartan-clad Sir James and Sir Alexander MacDonald (from around 1749) by William Mosman and a portrait of William Inglis, Captain of the Honourable Company of Edinburgh Golfers (circa 1790), by Sir Henry Raeburn, the most prominent portraitist of the Scottish Enlightenment. 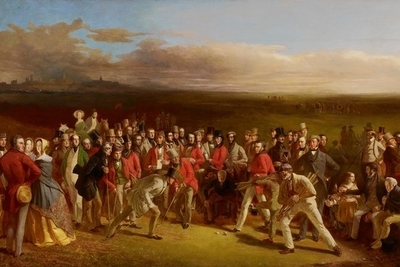 Here, too, is the famous "The Golfers," by Charles Lees, depicting the grand match on the Old Course at the Royal and Ancient Golf Club, St. Andrews, Scotland, in 1844. Many know it from the reproductions that hang in clubhouses around the world, but the 1847 original has never before traveled to the U.S.
St. Andrews, which calls itself "the home of golf," has lent several items to the exhibit, such as Sir George Reid's portrait of "Old Tom Morris," who won four British Opens in the 1860s and also designed several significant courses. Atlanta native Robert Tyre "Bobby" Jones Jr. (1902-71), who popularized golf on the international stage, merits a special section, full of portraits and photographs that illustrate his importance to the game. One, a color lithograph by an unknown artist, shows Jones winning the British Amateur tournament in 1930. Ladies make an appearance as well—for example, in "The Ladies' Club," an 1886 photograph by an unknown artist that illustrates the tightly laced, full-length clothes then worn by the women golfers at St. Andrews. 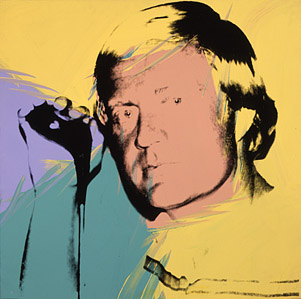 Andy Warhol's 1977 portrait of Jack Nicklaus and five cartoons from George Schulz's "Snoopy's Grand Slam," in which the "Peanuts" dog plays three tournaments including the Masters and the U.S. Open, are also on display, along with works by James McNeil Whistler, Childe Hassam, George Bellows and Norman Rockwell. The exhibition, which the High says is the first-ever devoted to golf by a major U.S. museum, was advised by Catherine Lewis, a golf historian whose books include "Don't Ask What I Shot: How Eisenhower's Love of Golf Helped Shape 1950's America." It will remain at the High through June 24 and will travel to the Museum of Fine Arts in St. Petersburg, Fla., in November.